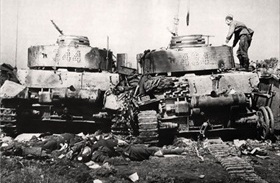 On this date in 1944 along a 450-mile front some 2.4 mil­lion Soviet front­line and support troops, 5,200 tanks, and 5,300 air­craft smashed through Ger­man lines in present-day Bela­rus (White Russia in some earlier sources). Sabo­tage of rail net­works and bridges by guer­rillas several days before June 23 im­peded Ger­man move­ment of ammu­ni­tion, food, and reinforcements to the German-Soviet front. The full weight of the Soviet attack came on the third anni­ver­sary of the Ger­man in­va­sion of the Soviet Union (Opera­tion Barba­rossa), when Ger­mans had poured into Russia, in the words of one Soviet citizen, “marching and singing, whistling and spitting.” Three Ger­man armies—Third Pan­zer, Fourth, and Ninth, whose front­line numbers approached a half-million men—each lost a majo­rity of their strength. The ini­tial tar­get of the Soviet blitz­krieg, Minsk, capi­tal of Bela­rus, was cap­tured on July 3. Opera­tion Bagra­tion, named for Gen. Piotr Bagra­tion, a storied gene­ral who had fought Napo­leon in 1812, produced a major crisis for the Wehr­macht (German armed forces) and demon­strated just how much the Soviet army and air force had learned in two years. Ger­man Army Group Center was vir­tually wiped out, losing over 300,000 men in 22 divi­sions; Army Group North on the Baltic coast was for the most part iso­lated, to be exter­mi­nated later at lei­sure; and the Soviet ad­vance had almost reached East Prus­sia, all with­in five weeks. Ger­man casual­ties for all three Army groups, which in­cluded a large propor­tion of Luft­waffe field units, security troops, Hun­ga­rian and Slo­vak divi­sions, and Volks­deutsche (ethnic Ger­mans from the occupied territories), were close to 400,000. Soviet casual­ties, who included parti­san irregu­lars, were also sub­stan­tial, with roughly 180,000 killed and missing and just under 600,000 wounded. Also lost were nearly 3,000 Soviet tanks, over 2,400 artil­lery pieces, and 822 air­craft. None of the losses deterred the Red Army from massing that sum­mer within sight of Warsaw, Poland, the country where Adolf Hitler had em­barked on his brutal war of con­quest nearly five years before. Col. Gen. Heinz Guderian’s assump­tion of com­mand on the East­ern Front, as well as shifting men and resources to the weakest sectors to sta­bilize German defense lines, did little to stop the rot in Nazi fortunes. Above: Overview of military opera­tions con­ducted by the Red Army in the Baltic states, Belarus, and Poland during Opera­tion Bagra­tion. 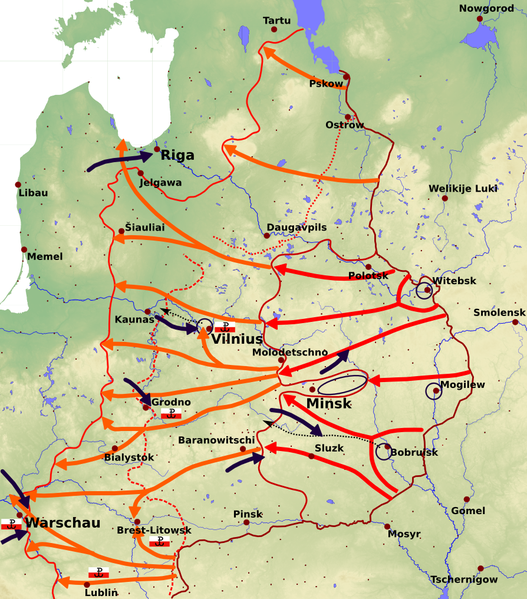 Soviet offen­sive opera­tions during the first phase are shown by red arrows ending at the squiggly brown line in the middle of the map, the following phase by burnt orange arrows. Ger­man counter­attacks are shown by short black arrows. Geo­graph­i­cally, Bagra­tion dwarfed the West­ern Allies’ cam­paign for Nor­mandy, launched just three weeks earlier. The Soviet blitz­krieg was intended to sup­port Allied opera­tions in France (Opera­tion Over­lord), liber­ate Soviet ter­ritory the Ger­mans had seized in their 1941 assault on the Soviet Union (Opera­tion Barba­rossa), and break the back of the Wehrmacht once and for all. It achieved all three goals. Left: By the time the Soviets launched Opera­tion Bagra­tion, parti­san num­bers in Belarus had swelled to between 143,000 and 374,000. Ger­man anti-partisan opera­tions between Janu­ary and April 1944 had exter­mi­nated entire vil­lages. All told, an esti­mated 1 mil­lion people, including Belarus’ entire Jewish popu­la­tion, had been killed. 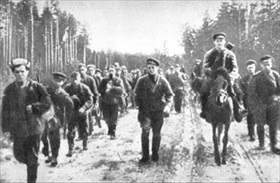 The Red Army directed parti­san forces, increa­singly well organized behind Ger­man lines, to maxi­mum advan­tage before and after Bagration’s start date. Right: Dead crew members and two de­stroyed Pan­zer IVs belonging to the German 20th Pan­zer Divi­sion were among the 50,000 troops killed and 20,000 cap­tured by Gen. Kon­stan­tin Rokos­sov­sky’s First Belo­rus­sian Front in the Babrujsk (Bobruisk) sali­ent in Bela­rus by end of June 1944 (above map, lower right). Rokos­sov­sky was the Soviet gene­ral who had accepted the sur­ren­der of the Ger­man Sixth Army at Stalingrad in early February 1943. 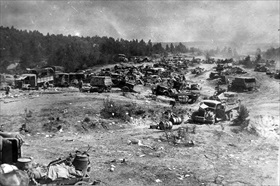 Left: Abandoned vehicles of the German Ninth Army, Babrujsk, Belarus, late June 1944. A disor­ganized and demor­alized Wehr­macht never recovered from losses of man­power and equip­ment in­curred during the Soviet offen­sive. Man­power losses alone were roughly a quarter of its East­ern Front strength, similar to the per­cent­age of Ger­man losses at Stalingrad (November 1942 to January 1943). 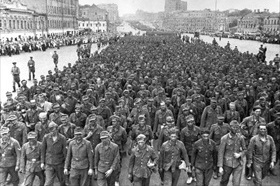 Right: German POWs in Moscow, July 1944. Com­pared to other battles, Bagra­tion was by far the greatest Soviet victory in numeri­cal terms. In order to show the out­side world the magni­tude of their vic­tory, the Soviets paraded 50,000 Ger­man pri­soners taken from the en­circle­ment east of Minsk through Mos­cow’s streets. Marching quickly and twenty abreast, the Ger­man POWs took 90 minutes to pass the reviewing cameras.